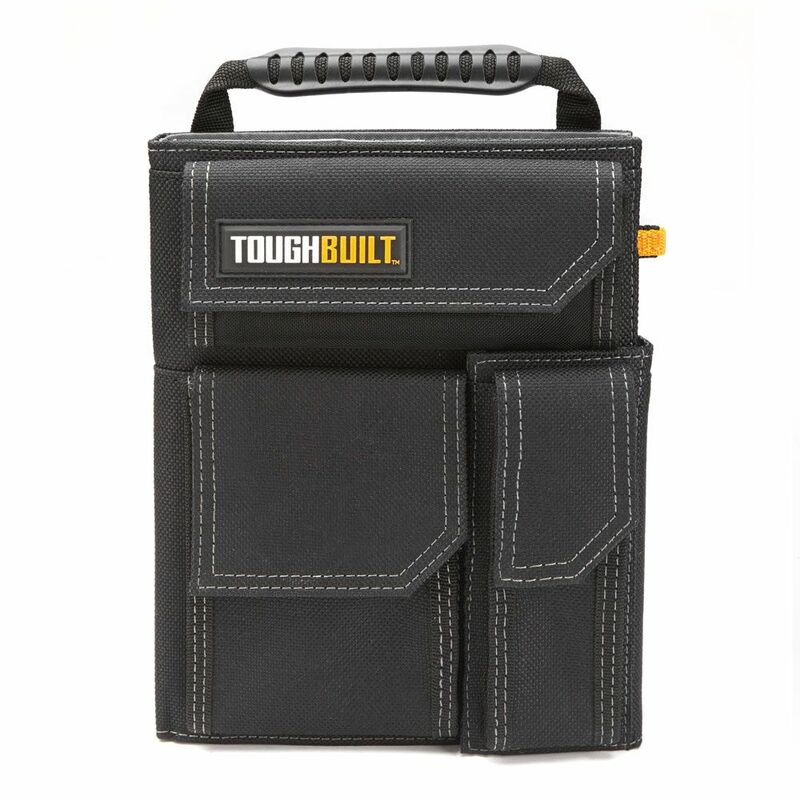 The ToughBuilt Organizer + Grid Notebook (Large) keeps you organized in the field. It includes a heavy-duty ToughBuilt Grid Notebook perfect for taking notes or drawing up plans. Its 3 external pockets allow quick access to everything inside, with room for your keys, pens and pencils, and other personal items. To simplify organizing while on the run, this Organizer features a top handle, rear hand strap, smart phone pocket, zipper mesh pocket, business card slots, and pencil pocket. It also features steel d-rings so it can be used with a shoulder strap. The ToughBuilt 20 inch Massive Mouth Bag transforms how professionals carry tools and supplies. The patent pending opening is wider than anything on the market for superior accessibility. The unique octagonal shape with rigid plastic Hard Body lining protects everything inside and keeps its shape. Comes with a lockable zipper for security and safety. Its 51 versatile pockets and loops include a covered notebook pocket, structured external pockets that flex to securely hold tools in place, and durable zippered mesh pockets for visibility. Made with high-quality, rugged materials and heavy-duty rivet reinforcement, this hard-working bag keeps up with the professional's rigorous demands. The ToughBuilt SoftBox Tower 3-Pack simplifies storage for small supplies. Three different sizes give versatility. Featuring a heavy-duty mesh window, and a wide, zippered opening, these SoftBoxes provide superior visibility and accessibility. Label windows make organization a breeze. Made with rugged, structured sides, these Softboxes withstand the most rigorous work environments. The ToughBuilt FoamFit Specialist Thigh Support Stabilization Knee Pads are the new benchmark for all-day kneeling ergonomics, comfort and functionality. Provides ultimate stability while maintaining easy side-to-side movement. Integrated thigh support keeps the knee perfectly centered, never twisting out of the kneepad. The lower platform raises the shin off of the ground alleviating pressure on the ankles. Ergonomic foam design embraces the natural shape of the knee and upper shin, maximizing pressure distribution for an extremely comfortable fit. Organizer + Grid Notebook L The ToughBuilt Organizer + Grid Notebook (Large) keeps you organized in the field. It includes a heavy-duty ToughBuilt Grid Notebook perfect for taking notes or drawing up plans. Its 3 external pockets allow quick access to everything inside, with room for your keys, pens and pencils, and other personal items. To simplify organizing while on the run, this Organizer features a top handle, rear hand strap, smart phone pocket, zipper mesh pocket, business card slots, and pencil pocket. It also features steel d-rings so it can be used with a shoulder strap. Organizer + Grid Notebook L is rated 4.5 out of 5 by 13. Rated 4 out of 5 by Wil from Good so far. Needs a belt hook. Pockets are perfect... Good so far. Needs a belt hook. Pockets are perfect size, but spine will not accommodate much material. Rated 5 out of 5 by Eli from Awesome product.Stitched together well. Does its job.... Awesome product.Stitched together well. Does its job.